“Can you smell that?” has to be the dumbest question anyone could ever ask a dog. Of all the senses, smell is primary for a dog. In fact, scientists believe that a dog has up to 300 million olfactory receptors compared to a human’s 6 million and the part of the brain that is dedicated to interpreting smells is 40 times larger in a dog compared to that of the human brain. As such, dogs understand the world largely through what they smell. In the relatively recent past people started to use dog’s amazing nasal abilities in a way which literally has been saving people’s lives. 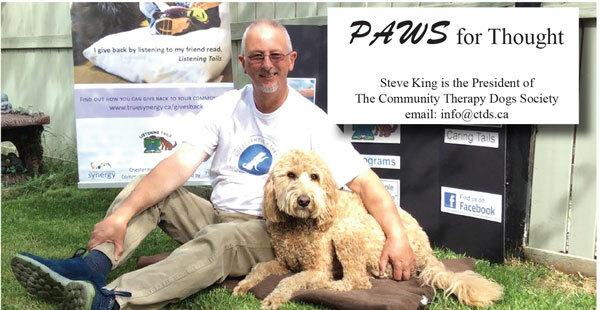 For example, the service dog organization I volunteer with (Lions Foundation of Canada) has been using dogs for a few years now to help people who suffer from seizures or who suffer from diabetes. Dogs trained to help people with both these disabilities are able to detect when a seizure or diabetic attack is imminent by the change in a person’s body odour, brought on by the body releasing different chemicals in the body. Dogs are trained to alert the person of an imminent attack, thereby allowing appropriate action to be taken. Another area where dogs are being used in the health care industry is the detection of cancer. Prior to dogs being used to detect cancer cells, patients would be reliant on, say, scans or biopsies to learn whether they had cancer or not. By training dogs to detect the smell of cancer cells in the body, people can take steps at an earlier stage to head off the problem, thereby giving themselves a better chance of survival. A story I’d like to share with you is of a friend who experienced firsthand the effect of having a dog sniff out cancer cells in her body. Unfortunately, like a lot of women today, my friend believed that something wasn’t quite right in her chest but did nothing about it initially. Then her dog, that was not trained to detect cancer cells, began to start sniffing her chest more and more, which was most untypical of her previous behaviour, and also started to gently nudge her chest. Convinced that her dog was trying to communicate something to her, rather than just being a goof or creating a new game, she sought medical advice. Despite going through various tests, she was told that there was no sign of cancer. Despite these results, her dog persisted with the sniffing so, after a short while, convinced her dog knew something the medical world had not found, my friend went back to her doctor who arranged for more tests to be carried out. Lo and behold, the new tests showed the first signs of cancer growing in her breast. By going with a gut feel that her dog knew something, she was able to ward off the problem and the cancer is now in remission, for which she will be forever grateful. Dogs may come across as the goofiest creatures sometimes but don’t ever question their ability to sniff something out. It may just save your life!